You are here: Home / Reviews / My Honest Moleskine Classic Notebook Review – Is It Worth the Hype? 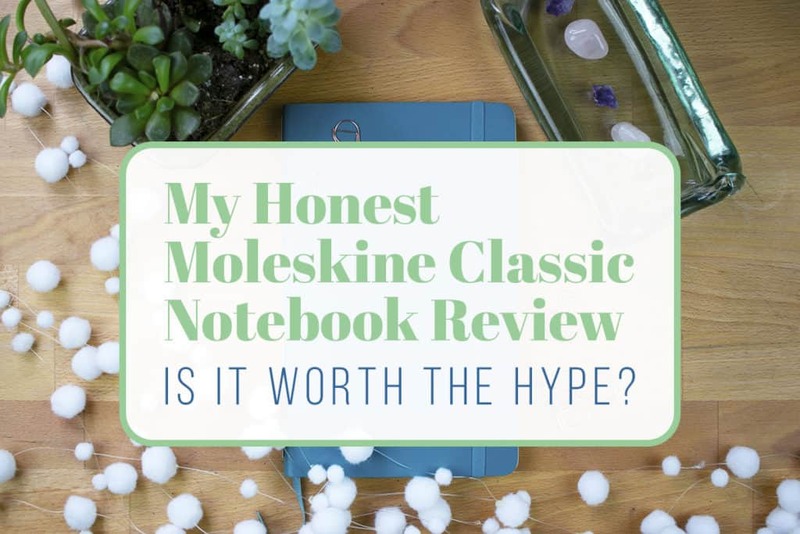 My Honest Moleskine Classic Notebook Review – Is It Worth the Hype? Within and without the bullet journal community, there is a passionate fervor for Moleskine classic notebooks. They are popular. And honestly, it’s easy to see why they appeal to the journal-loving audience. They have massive brand recognition, they are beautifully designed, and they are widely available. What’s not to love? 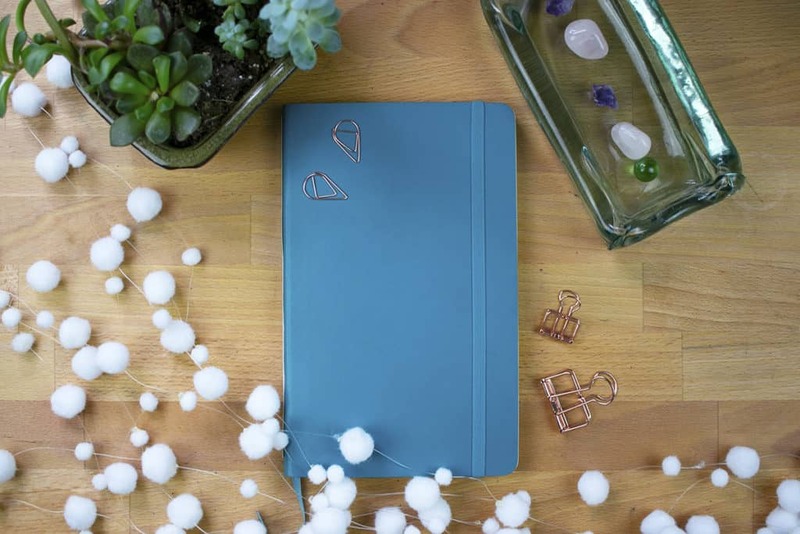 After several years of trying out all kinds of journals, I have experienced the positives and the negatives of this massively popular notebook. Keep reading for a full Moleskine classic notebook review and see if these journals are really worth all the buzz. By the time I bought my first Moleskine classic notebook, I had already been using my bullet journal for a while. I decided that I would use my new Moleskine as a Morning Pages journal instead of using it as a bullet journal. The Moleskine notebook I bought was a 5″ x 8.25″ softcover journal with dot grid pages. In my Moleskine, I wrote three pages longhand with a fountain pen every day for months, so I’d say I got pretty acquainted with this notebook. And after all that time using the Moleskine, I was surprised by what I found. Of all the journals and notebooks that I see used in the bullet journal community, the Moleskine is the one that I see in the wild the most. I’ve seen the Moleskine classic notebook sold in local art stores, big box art stores, bookstores, and coffee shops. You can always pick one up if you’re out and about, or you can check out Amazon for a wide range of color and size options. What makes the Moleskine classic notebook so insanely popular? Here are some of the Moleskine’s stronger traits. First and foremost, I think it’s worth noting that a brand name always comes with some level of comfort. You know that lots of people have used and enjoyed this journal, and there is some level of status that comes with a name brand. After all, Moleskine markets their journals as the kinds of journals academics, artists, and intellectuals use. When you use a Moleskine journal, you can’t help but feel that you are some kind of respectable author writing your next best-selling novel or a professor making an important breakthrough in your research. At least, I know that I feel that way. It’s something that very few other journal brands have made me feel, and I think I can say it’s due to Moleskine’s marketing. As I mentioned above, Moleskine is incredibly easy to get your hands on. In fact, Moleskine is one of the very few high-quality notebooks that I’ve seen regularly in physical stores. Usually, I find that I have to purchase journals online or hunt down the nearest retailer. Some journals are hardcovers, some are softcovers. With Moleskine, you can get either — or both! The Moleskine classic notebook line has plenty of options for whatever type of cover you enjoy most. When it comes to options, Moleskine has you covered. 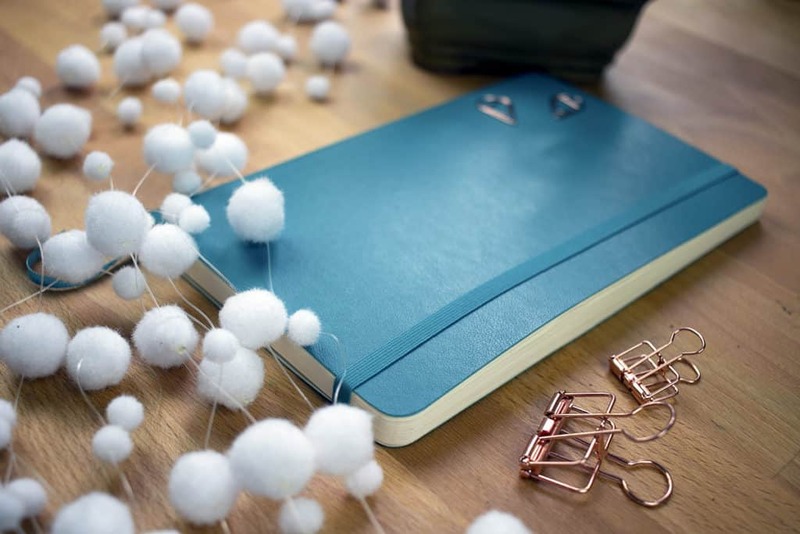 There are several different sizes and colors of notebooks, so you can find one that fits your needs perfectly. There are also several types of paper types, with choices between plain, ruled, squared, or dotted. This level of variety is certainly one of Moleskine’s major strengths. When it comes to cost, Moleskine does a pretty good job of keeping their prices moderate. Moleskine is by no means cheap, but their classic notebooks are quite competitively priced. I am a bit of a paper snob, which isn’t terribly shocking considering how much I like to hand letter and watercolor in my journals. The paper in the Moleskine classic notebook is only 70 gsm, as compared to the Leuchtturm1917 journal’s 80 gsm. 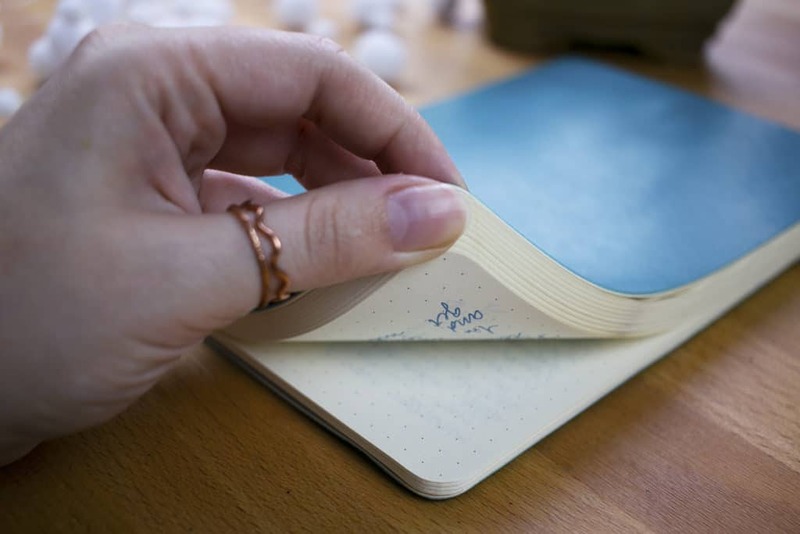 Among the most popular bullet journal notebooks, Moleskine has some of the thinnest paper. However, that doesn’t mean that it can’t take a beating. In my bullet journal watercolor test, I pushed my Moleskine classic notebook to the limit and it survived. While the paper didn’t handle the stress flawlessly, it did do a decent job of preventing bleeding or other drastic effects. One small detail that I think is worth mentioning is the pocket on the inside of the back cover. While I didn’t tend to use this pocket that often, it could be a handy addition for anyone who likes collecting small scraps of paper like movie tickets or receipts. There are certainly a lot of benefits to the Moleskine classic notebook, but I ran into several flaws that I thought were pretty darn irritating. The Moleskine was able to hold its own during the brutal watercolor test, but I still wasn’t totally blown away by the paper overall. I found that the paper in my Moleskine classic notebook was quite prone to ghosting, which can be pretty annoying. And although the watercolors didn’t bleed, the stress of the wetness led to quite a lot of warping and wrinkling of the paper. When it comes to lettering, drawing with ink, or using a medium that’s heavy like watercolor, I wouldn’t choose a Moleskine classic notebook. It doesn’t quite measure up compared to other journals in this category, which is why I haven’t bought another Moleskine notebook. One thing that irritated me the most about the Moleskine classic notebook was the incredibly flimsy bookmark. As I said, I used my notebook for Morning Pages, which meant that the journal stayed safely in my office the entire time I used it. Somehow, despite this gentle handling, the bookmark managed to pull loose from the spine and detach itself entirely from the journal. I can’t help but wonder how the rest of the journal would have fared if I put it in my bag every day. Perhaps this issue was isolated and not all Moleskines are so fragile, but I’m less inclined to spend my money on a product that may fall apart at any time. Another qualm I have with the Moleskine classic notebook is with the strength of the elastic strap. I found that the elasticity of the strap wore out pretty immediately, leaving it weak and ineffectual. With the elastic strap being so weak, I wouldn’t feel comfortable putting the notebook in a purse or backpack. The elastic band is the security that is supposed to keep the journal closed and the pages safe, but I can’t say I’d trust this band to do its job. It might not be a big deal to some people, but I know I absolutely loathe when the pages of a journal get creased, torn, or ripped out entirely. The elastic strap paired with the bookmark makes me feel less than confident about this notebook’s reliability and sturdiness. When you’re trying to find the perfect journal, there are a lot of things to keep in mind. Moleskine classic notebooks are a great option if you want an affordable journal that you can customize to your tastes, but they aren’t great for all uses. I found that I’m not a huge Moleskine fan for the type of writing and journaling that I enjoy, but that is just me! You might find that the Moleskine classic notebook line is ideal for you and that you can look past some of this journal’s weaknesses. In the end, it’s totally up to you! I hope you have found this Moleskine classic notebook review helpful! Let me know in the comments section what product you want me to review next, and head to the My Supplies page to see some of my other favorite materials! Thank you for your review on the Moleskin! I have a 3.5 x 5.5 and i use it at least 3x’s a week for my birding list. I also keep it in my pocket while I’m birding. I agree the elastic is on the flimsy side, i clip my little pen to it. I have a separate one of about the same size that has watercolor paper. It’s the artist one, i believe. Now thats great for watercolor! Of course, the paper is too thick for Bujo in my opinion. I’m new to Bujo so I’m still searching for inserts for my Standard that can handle watercolor too! I’ve used Moleskine journals and 18 month planners for years and have had no problems with the elastic or bookmark ribbon. I like the lighter weight paper for the compact size and relatively light weight of the overall journal. I have never had one come apart and they have lived in my purse and back pack and kitchen counter and travel carry on. Thank you for sharing that with me Jayna! I’m glad to hear you haven’t had these same issues. Thanks for your review, Shelby. I, too, found the bookmark flimsy; however, I DID put it in my bag or purse and I attributed that use to causing the bookmark fail. I found their paper acceptable. I had one of the bendy covers to start with but have been more cautious after that first journal, and I do like the hard covered journals. Since I don’t water color, I’m not having a problem with ghosting. Thanks for your review and including the specific examples/reasons. You’re so welcome Madonna! The hardcovers seem to just keep your journal safer. I have been a fan of Moleskin for at least 15 years. 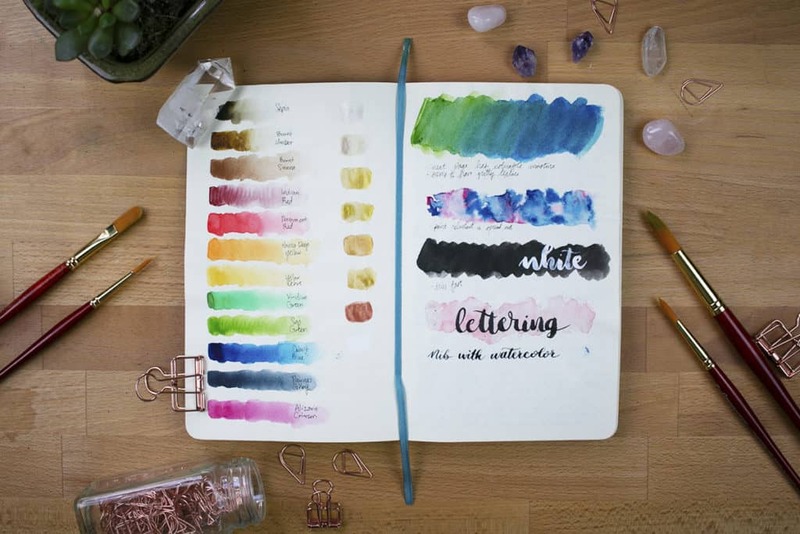 I think for watercolors, the thicker pages on their original blank sketchbooks would be a better option than their regular bullet journal notebooks, which have much, much thinner pages. Just not the right Moleskine for this particular job. One of my favorite things about the Moleskine is the real leather covers. This is one of my pet peeves of the Leuchtturm1917. Perhaps some prefer a vegan cover, but I love love love the buttery feel and unsurpassed durability of the Moleskine covers. Comparing the covers of my A5 Leuchtturm1917 bullet journal to the Moleskine planner I use at work, the feel of the Moleskine is still something I want to touch and hold, where my Leuchtturm1917 feels kind of tacky and not as satisfying. I do think the Moleskine journals are narrower than the Leuchtturm1917, which is a bummer. But after using an A5 Leuchtturm1917 for my 2018 personal bullet journal, I have determined that I don’t like the A5 size at all. Yes, it fits in my bag, but I prefer a larger page like the Moleskine Extra Large (7.5×10) format. The Moleskine Pro Weekly Diary has been my work planner for the last 4 years. As long as I am careful on my pen choice to limit ghosting, it has been a huge productivity tool for me at the office. It is also the “Extra Large” size for Moleskine, approx 7.5×10. The extra large format is still easy to tuck in a tote bag, but it also has the extra room to “breathe” and write, which I really like. After my first official complete year of bullet journaling with the A5 Leuchtturm1917, I am in search of a new bullet journal for next year. As I said, I am not a fan of the A5 size, so I am considering the Extra Large bullet journal from Moleskine. Yes, I will have to be careful with my pen choice to avoid ghosting, but truth be told, I have to do that with my Leuchtturm1917, anyway. I will miss the extra bookmarks, but since Leuchtturm1917 doesn’t have this larger size (or the real leather cover), I think I’ll go back to Moleskine. 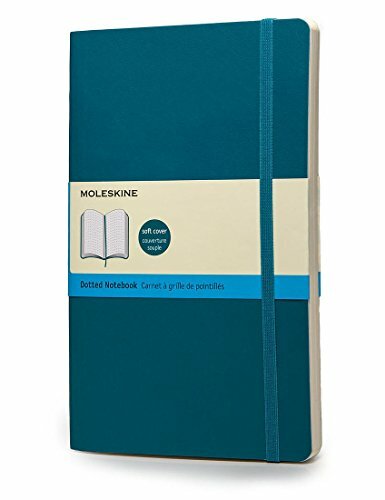 I just with Moleskine offered the XL hard cover bullet journal in other colors. I think that the only hard cover in they offer in this size is black. You can get other colors, such as teal and red, in the XL size, but they are softcover. Softcover might be not as heavy in my bag, but I wonder if it will be too soft to write on in my lap when I’m on the go and away from the desk. Anyway… thanks for the review. I love your site and all of your resources. I just think that watercolors were never a good match for this particular Moleskine. There are plenty of other Moleskines that would be much better suited for painting and markers. Will never buy a moleskin again. The paper is really bad quality. I’ve found the Artists Loft journals from Michael’s quite satisfying for bullet journalling. It has two bookmarks, comes in several colours and sizes, and even has index pages at the front! For five bucks for the A5 size, I’m impressed! I have used several of the michael’s ones and they definitely hold up well and the two bookmarks are fantastic. Biggest draw back for me is the ghosting and how thin the pages are. Great if you’re a minamalist not great if you’re a creative. They are definitely useful and the price can’t be beat especially for minimalist spreads like you said Amy! Thanks for offering your honest opinion. I Have wanted to try a Moleskine for years just because of the name, but have heard many people say the same thing you said about the paper. What is your favorite bujo to use then?? ARGH! The elastic always wears out, that’s one of my biggest peeves with Moleskine too. I used to use their daily planners for years, and ALL of the elastic bands are saggy and baggy despite the fact that I only use them at the end of the year to close the planner up for good! They should either eliminate it altogether or buy some better elastic. I do think, to give credit where it’s due, Moleskine as a brand really started us all down the path toward bullet journal notebooks of higher quality by reviving an old classic. Even though it’s no longer my preferred notebook, it definitely has its place, and it’s a brand that has inspired me to demand more from my notebooks (higher quality paper, numbered pages, pocket storage, etc). I have used Moleskines for several years and have only recently branched out to try other brands. I agreed with your evaluation of the paper, now that my Bujo use has expanded to lettering and some watercolor use, I find that heavier paper is useful. As for the bookmark and elastic issue, I have never had these problems. My notebooks have survived being thrown in totes, purses, and (the minis) in lab coat pockets. I agree with the paper quality. I found it to be a bit scratchy under my fountain pen nibs and the ghosting on almost all and bleed through with some inks was what kept me away from most of their notebooks. I have never had an issue with the bookmarks or the elastic, and I have abused a couple of small reporter notebooks that I tend to carry when traveling internationally. Thank you for the thoughtful review. Ghosting is (I think) the worst problem to have with the notebooks. I bought a relatively inexpensive “starter” journal at my local big box craft store. It does pretty well with fine point Flair pens, and some other similar Bic fine points. I use those to draw my boxes and grids for my habit tracking. Honestly, though, I’ve been using colored ballpoint pens lately. And I do really like those for journaling. Yes, all this is totally preference (and trust me, I love ALL office supplies. Every kind. It’s a curse). I hear you on the office supply love Erica! Thank you! I LOVE reading honest reviews.. I had wondered about Moleskin vs some others, this definitely helped. So glad this was helpful for you Angela. I’ve never used the Moleskine Classic soft cover, but I’ve had a lot of success with of their hard cover journals! I got a few larger paper-y covers for taking notes in classes while I was still at school, and they held up beautifully. I’m glad you’re enjoying all of the reviews Alison. Most products have their pros and cons so it’s great to hear both sides of it. Thank you for this. I would agree except for one point… i have used the Moleskin for several years and have never once had an issue with the elastic strap. It is in and out of backpacks, briefcases and purses and never been an issue though at times i have it stuffed… so- just thought I would share. Thank you for sharing that with us all Kerri! It may have just been a dud that I ended up with. Thank you for this honest review. Ive alway been curious about the Moleskin, but wadnt sure it was the journal for me. Now i know. It is not! Thanks again. I’m so glad this helped you make a decision BrendaLea. I totally agree on your review..I love moleskine for its size and soft cover but I’m not a fan of their paper quality. Wouldn’t it be great if they came out with some thicker paper Pei?! Thank you for your honest review of Moleskine. The brand is around for such a long time and I have kept wondering whether it is really worth trying. I will definitely try it in the future to see for myself, anyway thank you for your advice.